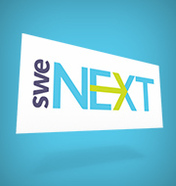 SWENext is a way to become part of the Society of Women Engineers as a student through the age of 18. Become part of SWE and #BeThatEngineer! Joining is free. Who can be a SWENexter? Up-to-date information about outreach events (camps, competitions, etc.) hosted by SWE and its partners. A catalog of available scholarships for engineering school offered by SWE and partner organizations. Best practices on applying for scholarships and internships. Eligible to participate in a quarterly webinars, where engineers from various disciplines discuss the work that they do. Resources for families and educators that can help effectively promote a career in engineering to your daughter and or female engineering students. A SWENext council where girls can influence the direction of this program ...and much more.